Ed Zink, left, talks with Navy veteran Tom Compton of Hesperus on Saturday in Silverton. The 44th Iron Horse Bicycle Classic is the first running of the event without Zink’s guiding hand. 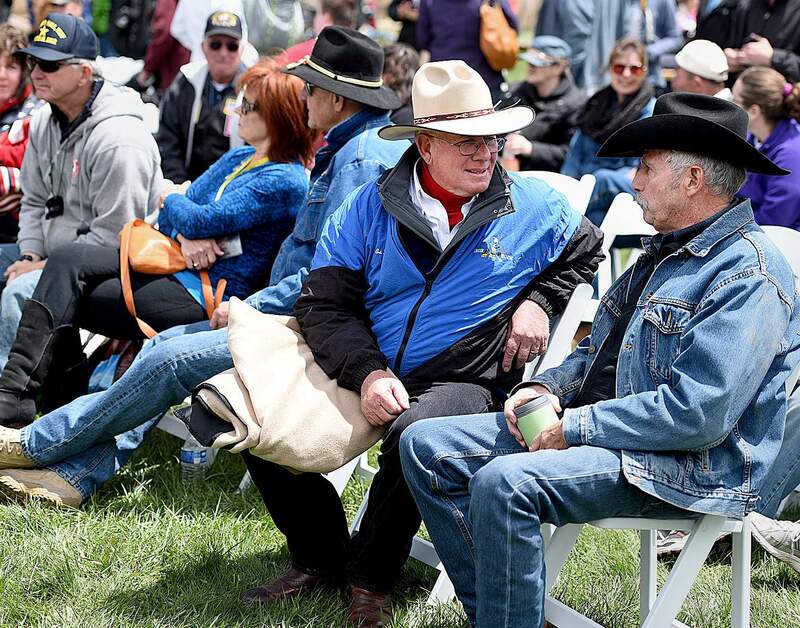 Still, he helped coordinate the inaugural Iron Horse Memorial Train, a new aspect to Iron Horse week that will honor veterans and give them another way to join the fun. When Ed Zink entered the second-floor headquarters of the Iron Horse Bicycle Classic just five days before the event’s start, those inside were pleasantly surprised to see him. He’d spent the morning visiting his dentist and recently completed a weeklong float trip on the Green River in Utah. In the days immediately preceding the Iron Horse, you were likely to find him toiling at his ranch or on the 50 acres of wetlands he’s developing in the Animas Valley north of town. This, of course, is not the Ed Zink we’ve come to know for the last 43 years. Yes, the 44th Iron Horse – with the usual decisions to be made about race details and the weather – is being run without Zink stressing over the details. The race’s co-founder and biggest proponent for more than four decades stepped away from the inner circle after last year’s event. With new Iron Horse board chairman Chris Vivolo ready to step in, and former director Gaige Sippy back at the helm, Zink felt confident after the 2014 Iron Horse that, at age 67, he could finally move aside. But don’t think for a second that he’s not extremely interested in the event’s success. When he left May 9 on his river trip, Zink turned off his cellphone, and didn’t turn it back on until May 15. Even upon his return, he only had six messages and just one Iron Horse-related. “I want to be out of the way,” said Zink, who was a co-organizer for the race’s initial running in 1972, then basically took the ball from there. “They deserve not to have someone looking over their shoulder. Zink continues to be a board member emeritus, although not a voting member. He was available on demand last week as needed, and he also helped coordinate the inaugural Iron Horse Memorial Train. More than 80 people with the Wounded Warrior Project, the Adaptive Sports Association and local veterans raced the 2,500 cyclists to Silverton via train. The staff at Iron Horse headquarters still was fairly relaxed on the Monday before Memorial Day weekend. So there was time for introductions and quick chats with some key team members. Chris Berger coordinates the volunteers. He was trying to wolf down lunch from RGP’s Flame Grilled Wraps while, ironically, organizing food for the volunteers stationed at various events. Berger got involved in helping out the Iron Horse through his parents, Lynda and Will Berger. Chris, who works for Durango Fire Protection District, grew up in Durango. That’s a long way from New Zealand, from where assistant race director Melanie Russek hails. Russek came to the U.S. with her snowboard to race boardercross, lived in Silverton for a while and now is a ski patroller. Justin McAfee, a longtime Durangoan and Montezuma County native, does a detailed job of coordinating registration of the approximately 4,000 race entries over the three-day weekend, Zink said. Dee Dee Carlson was spending the afternoon stuffing pencils and chocolates and stickers and more into water bottles. The bottles were for entrants in Sunday’s kids race. Carlson coordinates that race and has been helping out the Iron Horse for about 17 years. “All you have to do is say, ‘Dee Dee, the race starts at this time,’ and get out of the way,” Zink said. That’s why the event works, Zink said. He compared the team to a large band; everyone already knows how to play their instrument. Sippy gave kudos to Vivolo, who is no stranger to bicycle racing or the Iron Horse (he was transportation director for nearly three decades and is a longtime board member). He grew up in a family bike shop in Somerville, New Jersey, home to the country’s longest-running cycling event. Zink said that with several good partners supporting the event, plus the cachet it’s developed over the years, combined with the story of the cyclist vs. the train, the Iron Horse is not in danger of fading away anytime soon. Even without him. johnp@ durangoherald.com. John Peel writes a weekly human-interest column.